Yesterday, an American icon crossed the bridge. He was a good baseball player but I’m not going to bore those who live elsewhere than a baseball playing area with his baseball smarts. I’m going to give you his philosophy. There was a succession, Socrates, Plato and then Aristotle. 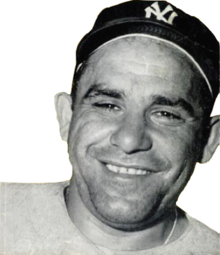 Then came the Romans and the preeminent Italian philosopher was Lawrence Peter Berra, better known as Yogi Berra. You could do a lot worse than follow Yogi’s advice. Here is teachings-I’ve left out the North American and sports specific quotes and left everybody with his principles to leave everyone to live by. Pair ’em up in threes. If people don’t wanna come out to the park, how are you gonna stop ’em? Little League baseball is a good thing because it keeps the parents off the streets and the kids out of the house. You better cut the pizza into four slices, because I’m not hungry enough to eat six. Pie a la mode, with ice cream. Yogi, you’ll be missed unless you’re still here. But his body of work lives on. What a baseball giant………..and all around “nice guy”………. I didn’t realize that he was still alive. Mama’s Mother always quoted him, and passed a love for him to her. Great tribute Kismet. I will be parroting some of these today. Better yet, We’re gonna print out your page. Go ahead. I can’t take credit for Yogi. The beauty of Yogi-isms is that they make sense. He was brilliant and he could play a mean game of baseball too. What a lovely tribute to a fantastic icon. Thanks-he provided you with a lot of material. You can see a lot by just looking ~ how true. Definitely one of the greats of the game. He was a hero for sure. And he loved balls.. That works for me and especially my brother Max. The difference between you and Yogi is that Yogi often gave up the ball to someone else. When he entered assisted living, he said “There are a lot of old people here”. We saw it on the News. SHE didn’t know he was still alive. Love his quotes. He could easily have been a politician in Oz! Yogi was much smarter than any politician anywhere anytime. Goodbye to a good man, and a kind soul. How come nobody cheered when you said “Brooklyn”? He will be missed and quite the interesting sayings!! Now, to whom do we look for humorous moral guidance? He was a star in commercials also. I didn’t realize that he was the ORIGINAL Yogi Bear. DOH!! !